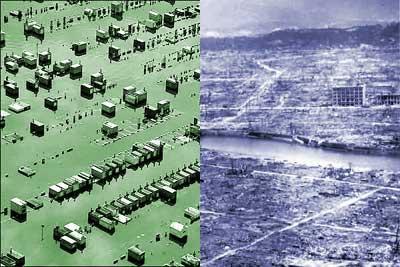 After viewing the scenes of devastation in New Orleans, Mississippi Governor Haley Barbour said: "I can only imagine that this is what Hiroshima looked like 60 years ago". This according to the BBC. In the flooded city of New Orleans hundreds, perhaps thousands, are dead and people are dealing with lack of drinking water and loss of their belongings. The storm came slowly, with much warning and media coverage. People had time to move to safer ground, although some might not have had the means. Now, the rest of the country is mobilising to help them. The atomic bomb dropped on Hiroshima killed 80,000. Those few remaining dealt with horrific radiation sickness and burns, massive outbreaks of disease, complete vapourisation of their belongings, a country collapsing after years of warfare, and a society in crisis. 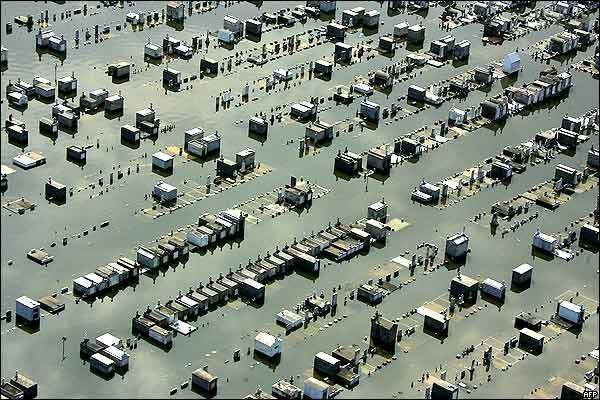 The flood was a natural phenomena, exacerbated by optimistic and shortsighted city planning. The Hiroshima bombing was an act of terror by one state on the citizens of another. Anyone who thinks there is even a reasonable comparison to be made between the two is a brain-dead idiot. Or, yeah, a US politician. The irradiated, terrified, and numb viewers of television news are the ones who in fact most resemble atomic blast victims. The picture on the left is from the BBC and that on the right comes courtesy of Wikipedia. Please check these sources for copyright info. * Alex Chilton, frontman for Big Star and the Box Tops, is safe and sound, according to various sources, including e-mails to Pitchfork purporting to be from friends of Chilton’s family. The Memphis Commercial Appeal reports that Chilton spoke to Ron Easley (his former bandmate in the Memphis punkabilly group Tav Falco’s Panther Burns) early Monday morning, who said that Chilton had been rescued by helicopter from his French Quarter home on Sunday.